Back in November, I visited Chiang Mai, a city in the mountains of northern Thailand. Chiang Mai seems to be the darling of Asia – everyone loves it. And I did too. It’s such an easy-going place: authentic but tourist friendly, plenty to do both inside and outside the city, surrounded by a moat. It’s pretty fantastic – perhaps one of the most livable places I’ve seen in Asia. Some of the main tourist attractions in the area involve elephants: you can find both elephant riding and elephant sanctuaries. There is a long history of elephant abuse around the world, whether it be relating to the ivory of their tusks or by forcing them to perform to make money. Chiang Mai has the full range of elephant-related activities available, which includes many inhumane options. My friends and I opted for Baanchang Elephant Park – a nonprofit dedicated to rescuing and rehabilitating abused elephants. The five of us were picked up in the morning and brought out to the park, which was about an hour outside of Chiang Mai. 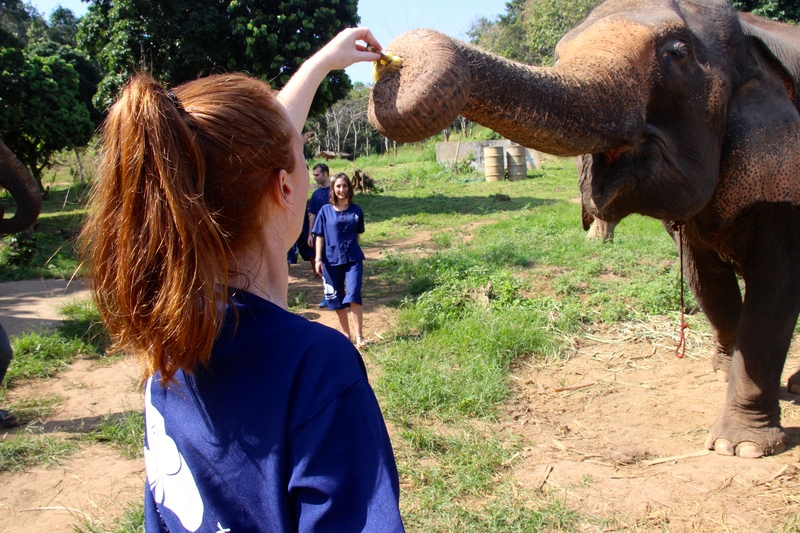 I was really happy with this choice, not only because we got to see, feed, and ride elephants, but also because we got a lot of interesting information about elephants and a better understanding of the evils that take place surrounding them. According to our guide, there are 5,000 elephants in Thailand. And unfortunately, abuse is still rampant. Elephants are exploited for all sorts of purposes. Often, they will be expected to do tireless amounts of work and are speared in the ear, which is an even bigger problem because their blood doesn’t coagulate like ours does. Elephants are used to beg for money and will often be injured from stepping on concrete (which causes them to lose their very keen vibration sense) or from car accidents, when the elephant will be toted in a trailer. They are commonly found locked-up with chains on their heads and body in the middle of the jungle. There is a belief that eating a part of the elephant’s trunk will make you powerful and the ivory is incredibly expensive, which means that elephants are in danger of poaching as well. 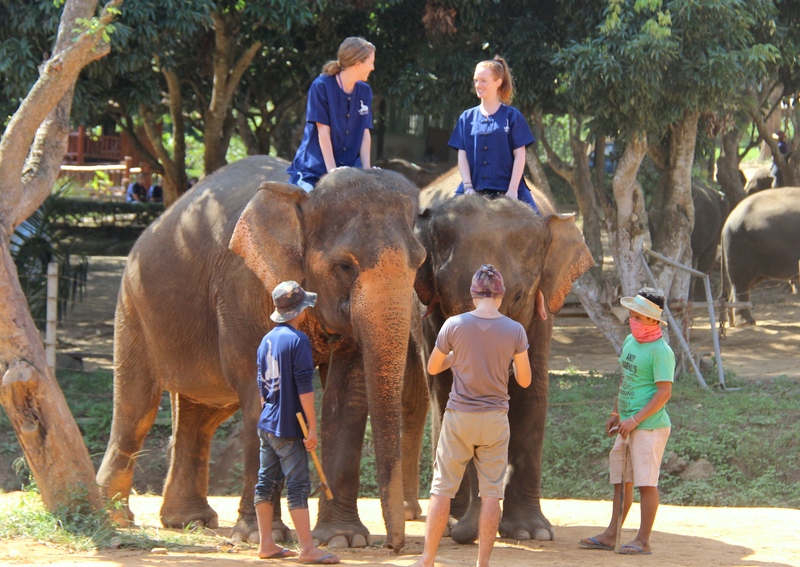 The popular elephant riding camps, which are right down the road from the park, will put wicker baskets on the backs of the elephants and load them up with people. An elephant can carry 400 kilos, but the chairs used at these camps are known for breaking their bones, which leads to problems standing, trouble eating, and eventual death. 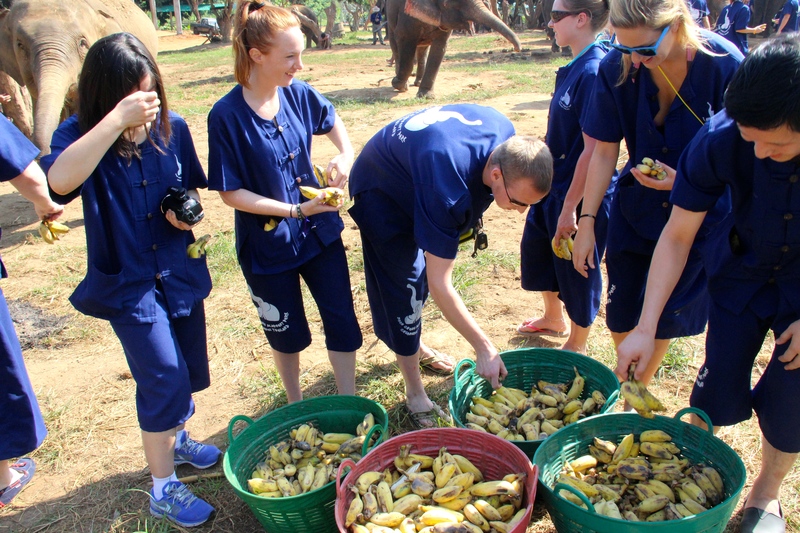 Baanchang has rescued 44 elephants and set up a facility with an onsite hospital in order to care for these abused animals. They have even used a crane to prop up an elephant who couldn’t stand in order to help her eat and improve. She can now walk and eat on her own. While the visit isn’t cheap, the money goes towards buying land, food, medicine, and anything else these elephants need to be rehabilitated. Once we arrived at the park, our guide handed us each uniforms – a navy blue shirt and navy blue shorts (more like shants). We looked like escaped convicts, but the uniform offered both function for us guests and familiarity for the elephants. Once in our costumes, we were taken out to the field to familiarize ourselves with these giant creatures. Entering the park, there were elephants stationed every meter or two and, the second you paid attention to anything other than where you were positioned, you’d see a trunk inches from your head. It was surreal. We were taught how to feed the elephants bananas (or more like how to hold them so they can take them from us and throw them in their own mouths), which was surprisingly entertaining. 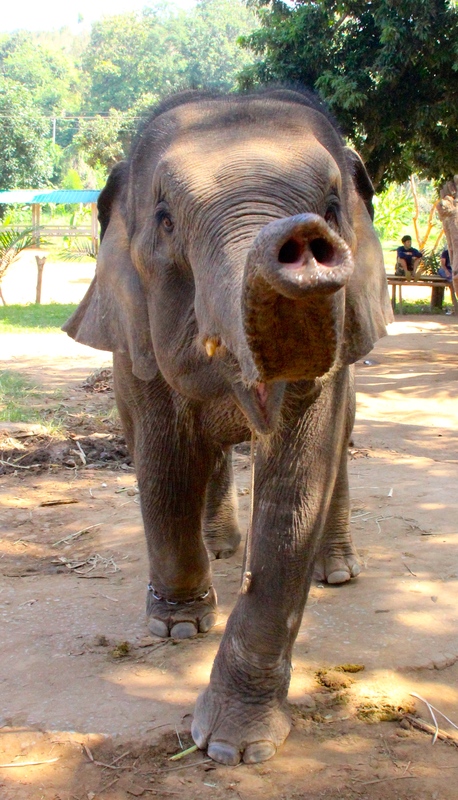 During our visit, our mahout taught us a whole lot of fun facts about elephants. They’re quite fascinating creatures – intelligent and emotional. Elephants sweat out of their eyes and toe nails. Just like a dog, elephants wag their tails when they are happy or excited. Elephants store water in their necks. 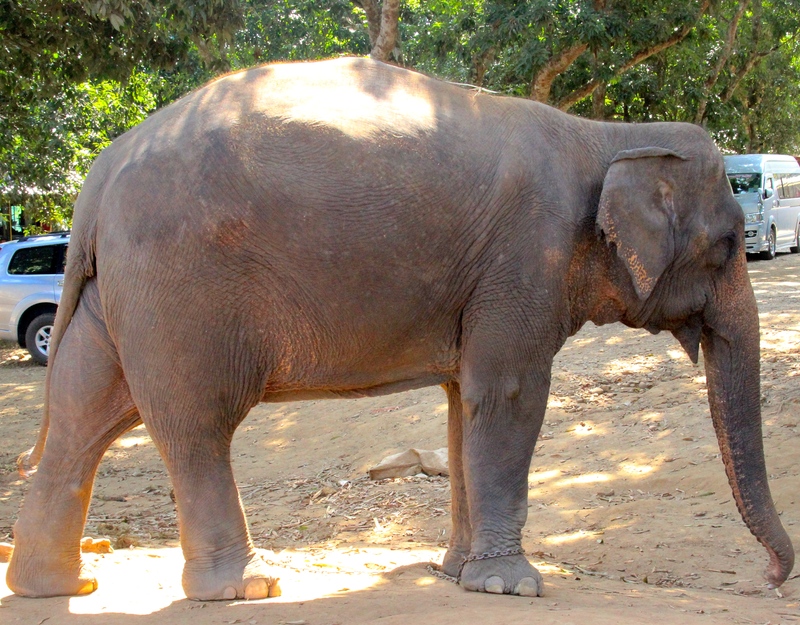 There is a blind elephant at Baanchang who uses his trunk like a walking stick to figure out what’s in front of him. And the tidbit I found most interesting: apparently, the elephants actually felt the 2012 earthquake before anyone knew about it and started wailing. They can hear and feel vibrations from 10 kilometers away. The mahouts were confused until they felt the shaking and understood they were being warned. After learning all about the elephants, we were taught how to ride on them. The way it was done is considered humane, as were no baskets causing harm to their spines. We rode on the elephant’s neck instead. Regardless of the lessons given, the strangest moment of the entire day was when our mahout said “Ok, now get up on the elephant.” It wasn’t as hard as I expected. The elephant bowed down, I stepped on it’s leg to hoist myself up on its neck. 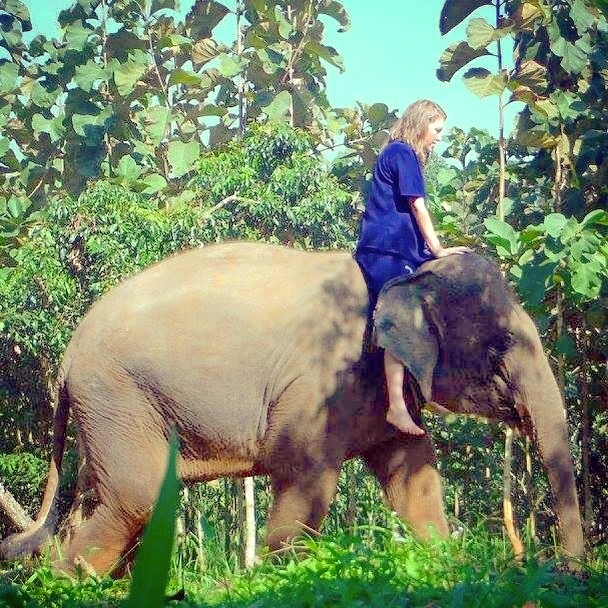 I held its ears for balance and when the elephant stood up fully as I was sitting on him, it was pretty damn scary. We got to practice in pairs before getting the entire group out at the same time. Michelle, my friend from way back in month two (Portugal), and I tried our first rides at the same time and looked over at each other, silently screaming about how ridiculous and thrilling it was. Once we completed the driving tests, we were assigned specific elephants to take on a trek through the jungle. Tong Un was my elephant. She was quite a gentle giant and much more relaxed than some of the others. Her mahout came alongside us on foot and we went around the surrounding jungle of the park. 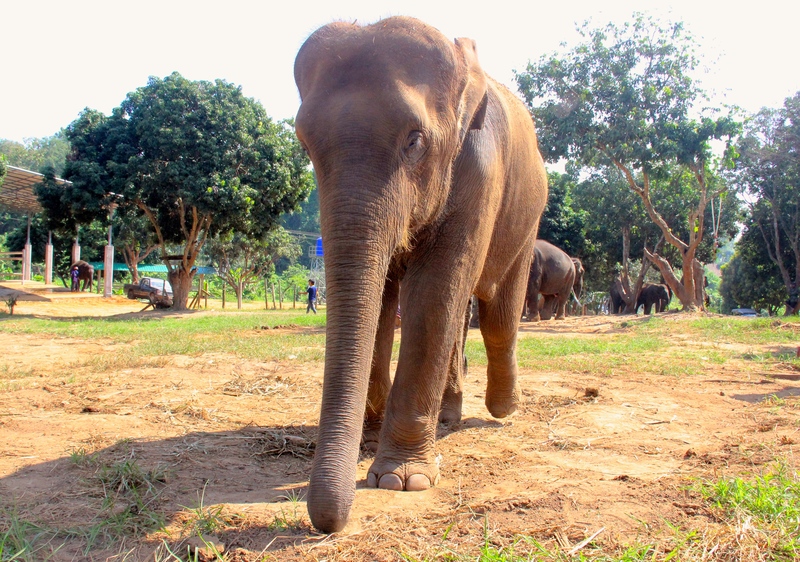 I asked for Tong Un’s story and, while the language barrier made it hard to get too many details, I was told that she was one of the elephants that had been locked up in the jungle. Her lack of energy seemed consistent with this, but she seemed content nonetheless. After a couple of loops and hills, we stopped at a little pond on site for a bath. Tong Un was happy to get in the water, but seemed completely disinterested in me. I tried to scrub her like everyone around me was doing, but she was trying to lay on her side in the water. I didn’t know this at the time, so all of a sudden there was an elephant foot a matter of inches from my head. It was a fun surprise. There was another moment when I felt something on my foot and assumed it was a fish, but actually it was one of the elephant’s trunks. He had been sniffing around down there and found my foot on the way. The whole day, I would forget about their trunks – those things are long and they are constantly using them to do something. My favorite use was by an elephant they call Gangster, because he likes to slick his hair back with his trunk. Very suave. At the end of the day, we were exhausted. 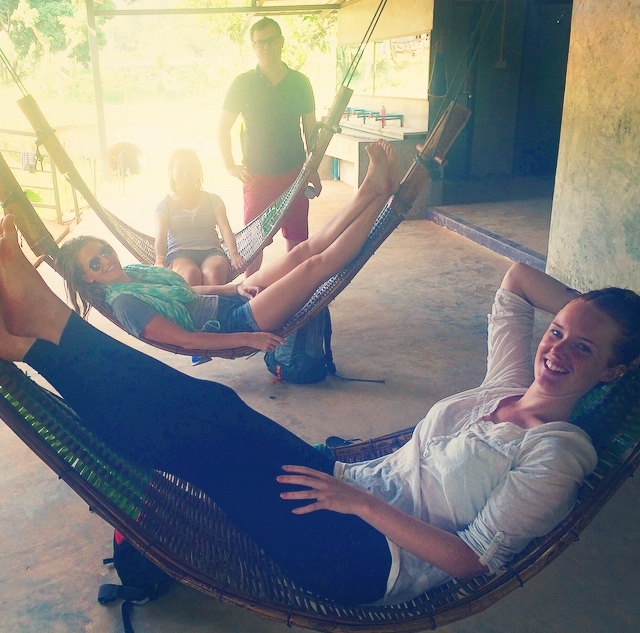 The adrenaline rushes we acquired from riding the elephants were long gone and we were happy to find some hammocks on site for the major crash we each had. I am hopeful that this trend of humane elephant parks or sanctuaries will keep gaining momentum. If you have the opportunity to get to Chiang Mai, Thailand – make sure you’re taking the high road! Tong Un and the gang would appreciate it. Fascinating, Char! What a great experience.